Eltronicschool. - This is one of the power supply project part in this time to show you one of the circuit schematic of Smart Master/Slave Switch using SMPS Module 5-V/3-W Type (HLK-PM01). Circuit schematic like in Figure 1 above is Smart Master/Slave Switch using SMPS Module 5-V/3-W Type (HLK-PM01). 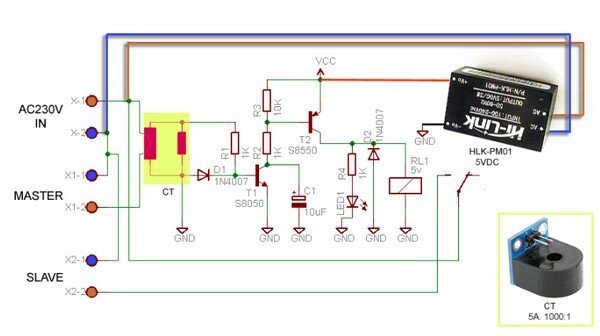 The main component in this circuit schematic is SMPS Module 5-V/3-W Type (HLK-PM01). According Electroschematics site describe that the circuit is designed around two key components: a current transformer and a compact SMPS module. The current transformer (CT) is a 5-A/1,000:1 type with a built-in “burden resistor,” and the SMPS module is a 5-V/3-W type (HLK-PM01). The current transformer is specifically designed for monitoring current, and you can wind a few turns of mains-insulated wire through its core to derive a useable output from the secondary. When the current transformer senses plentiful load current from the master unit, an electromagnetic relay (RL1) wakes up to power everything connected to the slave and falls asleep again when the master unit is turned off.